A Russian fighter’s confession that he killed 15 Ukrainian prisoners of war may be considered evidence of war crimes in court if the authenticity of the recording is confirmed, human rights and legal experts say. But these alleged crimes are unlikely to be considered crimes against humanity, and it would also be difficult to send them to the International Criminal Court. 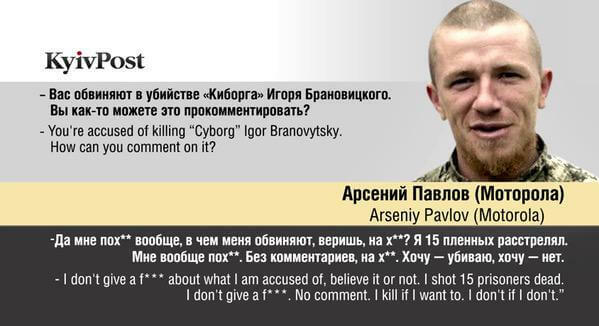 The statement was made by Arseniy Pavlov, better known by his nom-de-guerre Motorola, in a telephone conversation with the Kyiv Post on April 3. Motorola, head of the Kremlin-backed Sparta Battalion, said that he would not comment on presumed eyewitnesses’ testimony that he had murdered Ukrainian prisoner of war Ihor Branovytsky on Jan. 21.